A combination of cool air, clear skies and light winds allowed temperatures to drop seven-to-eight degrees below the monthly average in parts of South Australia, Victoria, NSW and the ACT on Wednesday morning. Image: Satellite image with surface temperature observations on Wednesday morning, shortly after sunrise. While mornings start to get cooler in the nation's southeast every April, today's minimums were unusually low for this point in the month. In NSW, Orange (-1.5C) had its coldest morning this early in the year for 36 years. 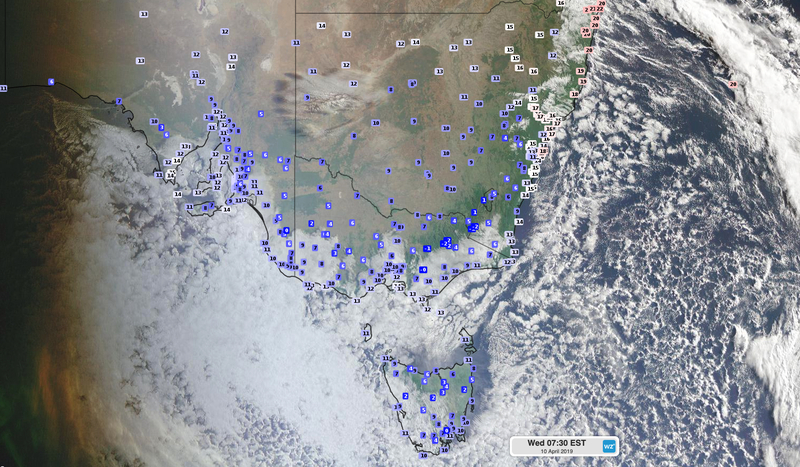 Canberra (0.5C), Forbes (4C) and Campbelltown (7C) all had their coldest start, this early, in 11 years. South of the border, Victoria's Longerenong (0.2C) registered its lowest April temperature in 10 years this morning. Bendigo and Nhill both reached 2.1 degrees, which was their coldest start this early in the year for 17 and 13 years, respectively. South Australia's Wudinna (1.9) had its coldest morning this early in the year for at least 20 years, while Lameroo's 2.8C was it lowest temp this early in the year since 2006. In addition to the prevailing weather patterns, the drought affecting large areas of southeastern Australia is also likely to have played a hand in this morning's chilly weather. Put simply, drier air helps cause lower minimum temperatures.